"I consider myself a very lucky person because I love my job. I am one of those few people that wake up in the morning and actually look forward to going to work. I love the aspect of my job that I have to deal with different people during the day. They become a big part of my life and most of them become my friends. Dentistry to me is an art. It is so rewarding to give people a smile that will change their lives, or get a patient out of pain that has been up all night with a terrible tooth ache, or give a child a good experience of dental treatment. Dentistry is one of the most rewarding jobs in the world. I am grateful that I had the opportunity to become a dentist to be able to be of service to my community." 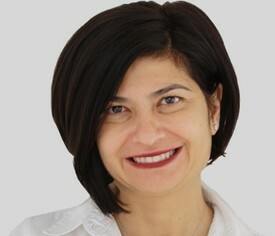 Dr. Nazanin Morshedi graduated from Guy's Hospital University of London in 1996. In 1997 she moved to United States and completed a 2 year residency course at the University of San Francisco and obtained a Certificate in Advanced Education in General Dentistry. She has a passion for dentistry and provides the highest standard of care for improving patient's oral health and giving the patients the smile that they have always wanted. Dr. Morshedi continuously attends seminars to keep up to date with the latest technology and products available. She has also completed her advance studies at one of the world's most renowned advanced studies centers called LVI in Neuromuscular dentistry. Dr. Morshedi is a true believer of providing options to the patients and leaving the final decision to the individual. She is proud to provide pain-free dental care. She also likes to provide follow-up care to all her patients, works with the most qualified lab technicians and top of the line specialists to produce the best results for each individual. Dr. Morshedi is currently living in the Peninsula with her husband and son.